Visitor Information Point at Wakefield Cathedral01924 373923work Information CentreAre you in the city for the day and want more information about Wakefield? 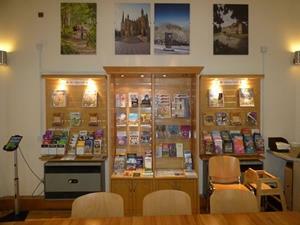 Wakefield Cathedral is now home to the new Visitor Information Point, your first port of call for tourism information in the Wakefield District. Located inside Treacy Hall next to the Cathedral, the VIP offers both visitors and local residents up to date information about where to go and what’s on across the Wakefield district and wider areas of Yorkshire. You’ll be welcomed by friendly volunteers who are happy to help with all of your tourism enquiries. The VIP offers information on new exhibitions, upcoming events and festivals, countryside activities for families, performances and live music events, how to get around on public transport and information on wider attractions and places of interest in Yorkshire. Are you in the city for the day and want more information about Wakefield? The Visitor Information Point is here to help you get the most out of your visit to Wakefield.